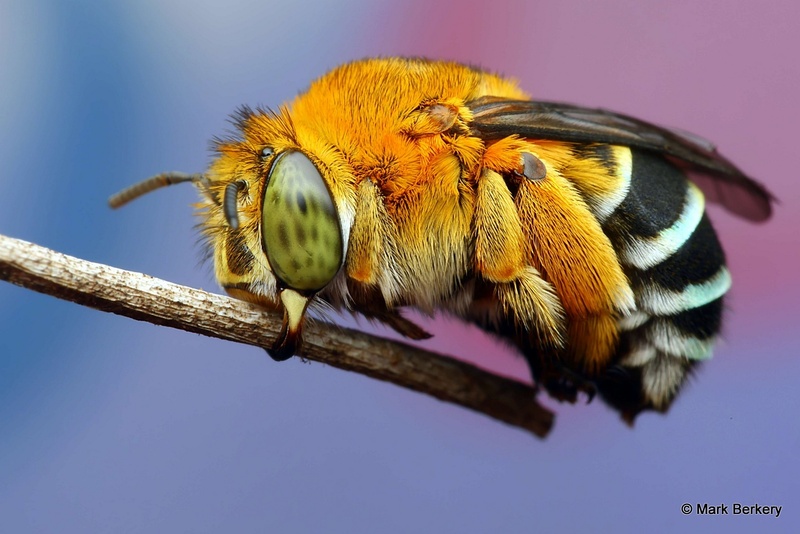 One Blue Banded Bee left on my side of the fence after a long dry summer and recent wild weather. 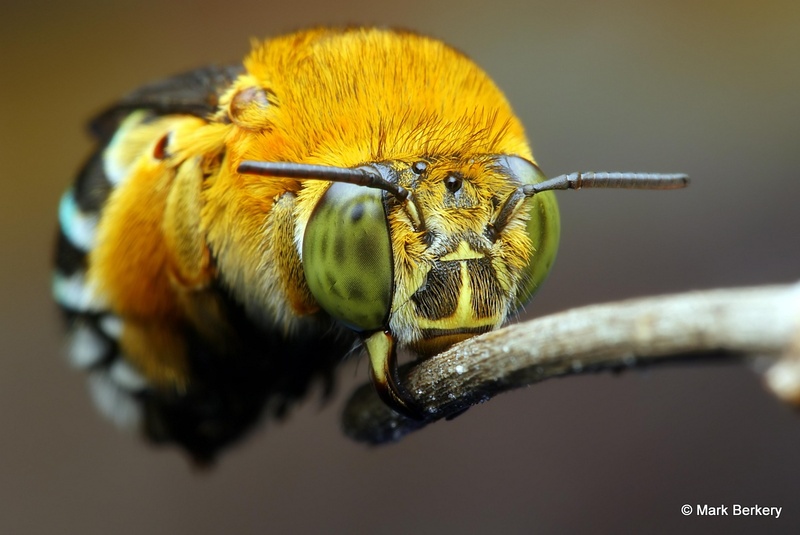 She is … They roost in the most unlikely places, not always predictable but they can be tracked at dusk when their buzzing gives them away in the approaching twilight. 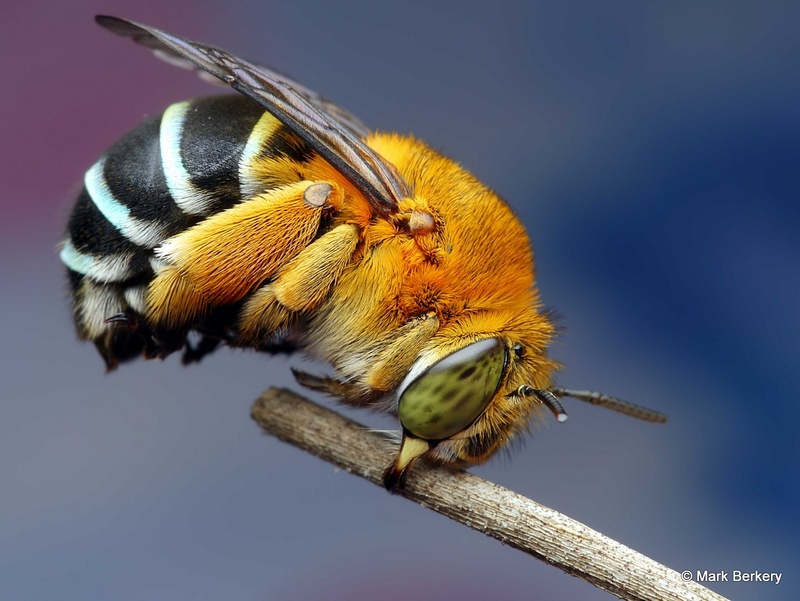 Absolutely stunning images – some of the best ones I’ve seen of bees! Exceptional! 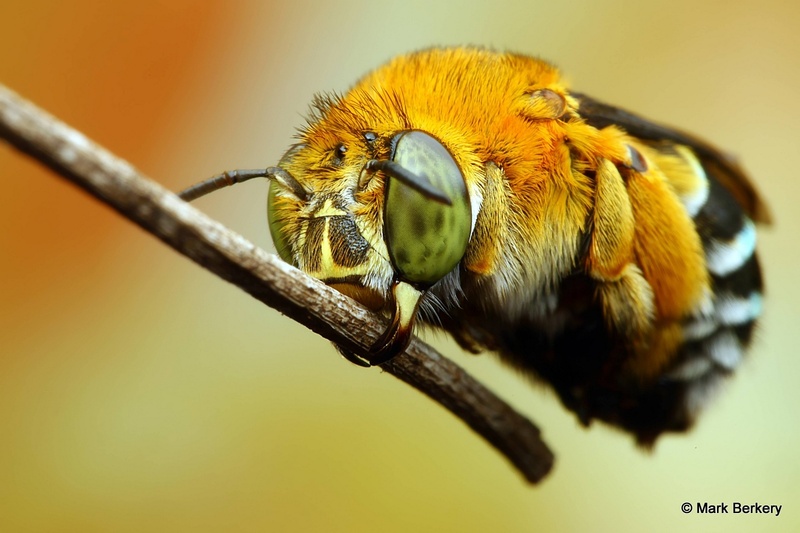 Fantastic photos, I love the bee’s eyes. The way they fly/zip around with ease those eyes are effective too. Fantastic the way of posture and a pleasing look, very near to “cute” with its round shape. Beautiful photography, that shows, how much human eyes cannot notice without a lense. There is a little beauty behind every form. It’s just a matter of seeing it to capture it, to convey it. It’s a largely hidden world of form, and sense. More can see it these days – with a lens, of one kind or another. Is the wee one alive? If so, what balance! Yes, it’s alive. That’s how they sleep every night. Is that how she sleeps? Holding on, like that? Is she alive? She is beautiful. Beautiful photographs, Mark. You are the best!! Yes, she’s asleep holding on like that. The backgrounds are pieces of paper that were handy and appropriately coloured. Beautiful. How did you get it to grip onto the twig? Was it dead on your fence when you found it? Just curious. That’s how they sleep. At dusk they can be heard buzzing their usual roost, or a new one, and settle soon after. You have to be very careful not to wake them as they then head for the light and it can be difficult settling them safely again – not impossible. Wow! I love learning new stuff like that. Thank you. Nature is a mirror, of self – instinctive self. If it is. Great shots once again Mark. Isn’t it the wrong time of year for these blokes to be around? No, it’s still warm enough and there’s still food enough. There’s another ten of them on the other side of the fence – in the shelter of a star jasmine vine, and others around the place – haven’t seen much in the ‘wild/bush’ though.